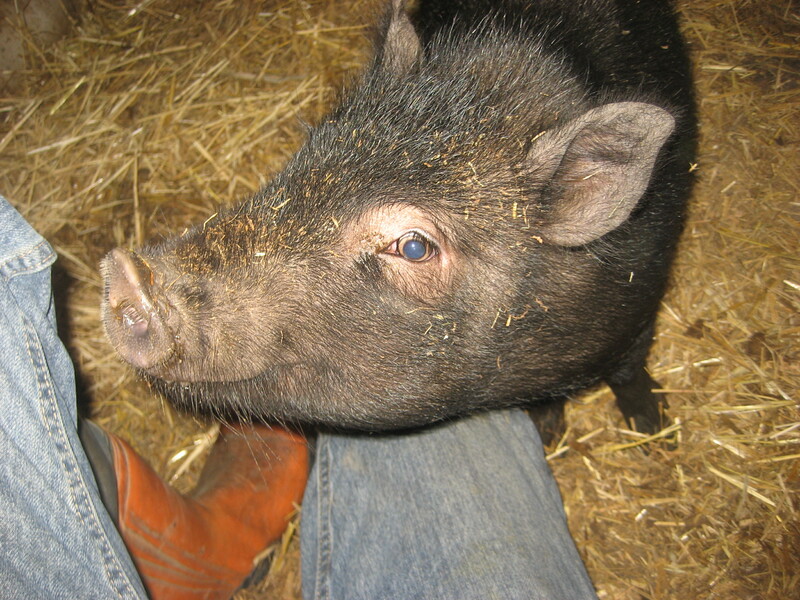 The two most recent four-legged arrivals at Donkey Paradise are Bella, a big brown horse, and Stevie, a wee black pig. Both came from the same place near to Arriondas. Marleen heard about Bella first. 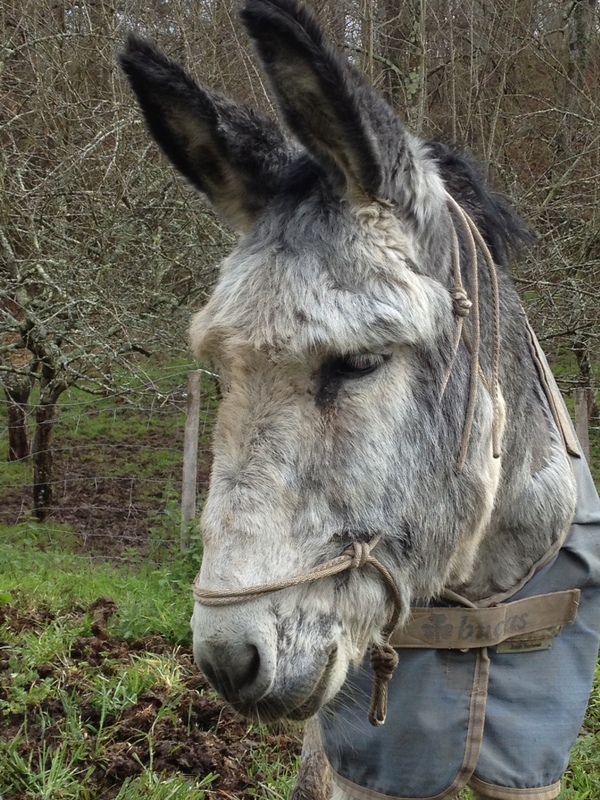 Her owner called to say the beautiful old horse of his childhood was going blind; could Marleen do something about her eyesight, or maybe even take her to Donkey Paradise? She was, after all, the beautiful old horse of his childhood, and it would break his heart to have to take her to the slaughterhouse. Marleen arranged for a vet specialising in eye treatment to examine Bella. The vet said that with antibiotic eyedrops, one eye could be completely saved and the other partially restored. Bella would not go blind after all. I went with Marleen to give Bella her first eyedrop treatment, and there I saw what squalor she was living in. Bella is a large horse, as large as any of the animals at Donkey Paradise, but her stable was just a few times larger than she was. She had no water to drink, and the floor of her stable was filthy. Her brown-and-white hair was terribly knotted all over and covered in sticky burrs. I expected a horse living in such unpleasant conditions to react badly to strangers. However, Bella took her first eyedrops without any fuss. She also drained an entire bucket of water, poor thirsty girl. Marleen continued to visit Bella morning and evening for the next week and a half, administering eyedrops and a little food and water. Bella responded very quickly to treatment. Within a few days she started to come to Marleen as soon as she arrived (thankfully the weather was fine so Bella could be out in the field rather than in her stable), and she continued to take the eyedrops willingly. 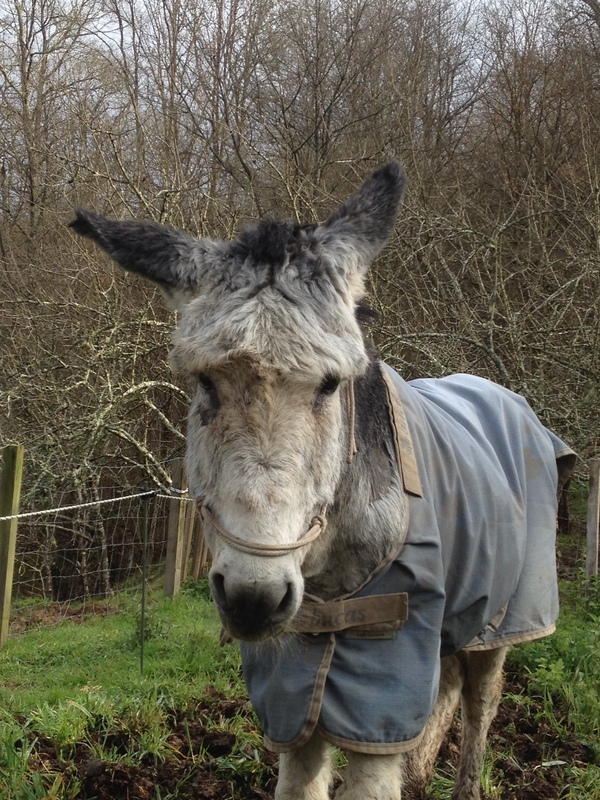 Soon she would be ready to come to Donkey Paradise. 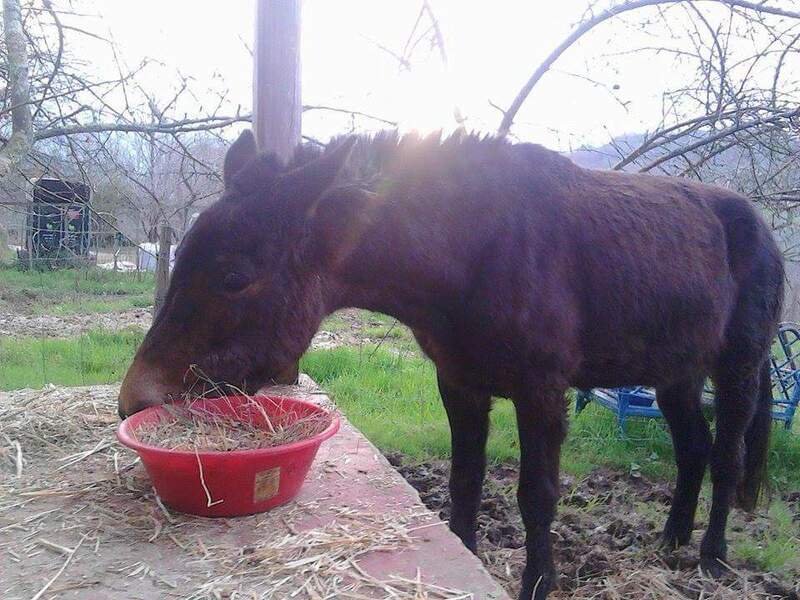 The transition of a new animal into life at Donkey Paradise is never guaranteed to go well. Often, they are animals who have been abused or neglected, and they sometimes find the transition very stressful. So, when Bella arrived in a big white truck, we all watched to see how she would act once released into her new home. Thankfully, Bella quickly identified a patch of green grass in front of the house and began grazing on it. She seemed calm and curious. She went peacefully to her new quarters – the Perrera, a fenced-off area within the main paddock – and ate fresh oat straw from her large trough. 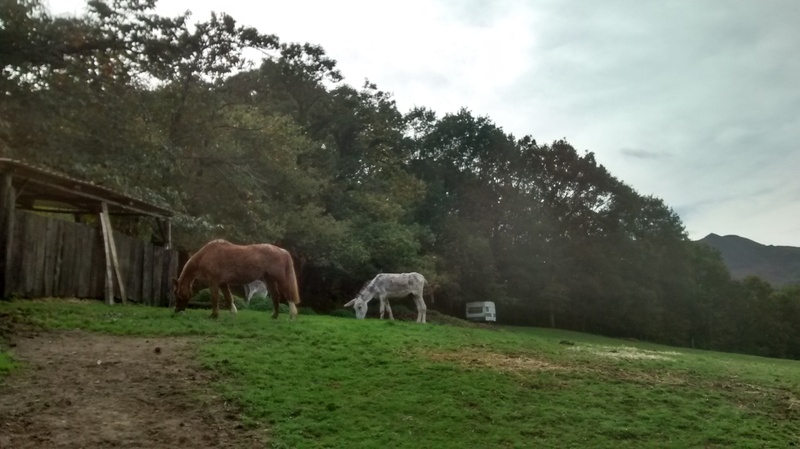 That night, the two white horses that roam free in the main paddock, Kari and Mara, trotted over to the Perrera and got acquainted with their new equine compatriot. They haven’t had a chance to spend any time roaming together yet, but they will in time. Maybe they’ll be friends? With food, medication, and shelter established, there was one more matter to take care of to improve Bella’s quality of life: her knotty hair. 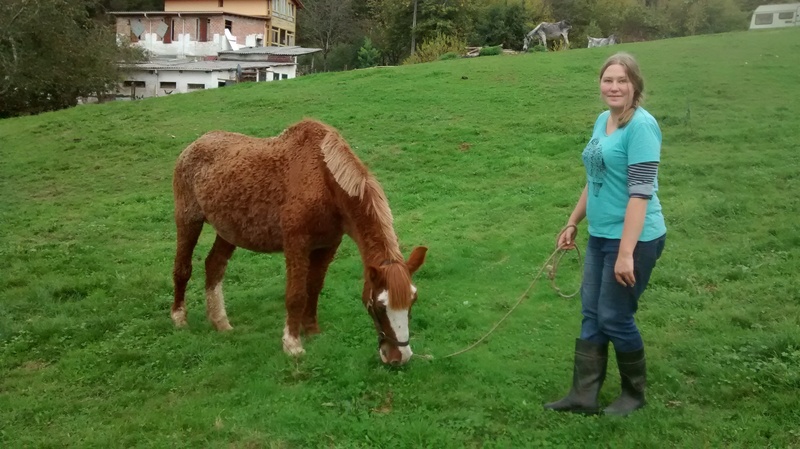 Volunteer Marieke took on the task of brushing Bella all over, and an hour and a half later, Bella was restored to good condition. She is perhaps cleaner than she has been in decades. Now Bella is allowed to wander the main paddock during the day, grazing at the acres of fresh grass and chomping the occasional fallen apple. 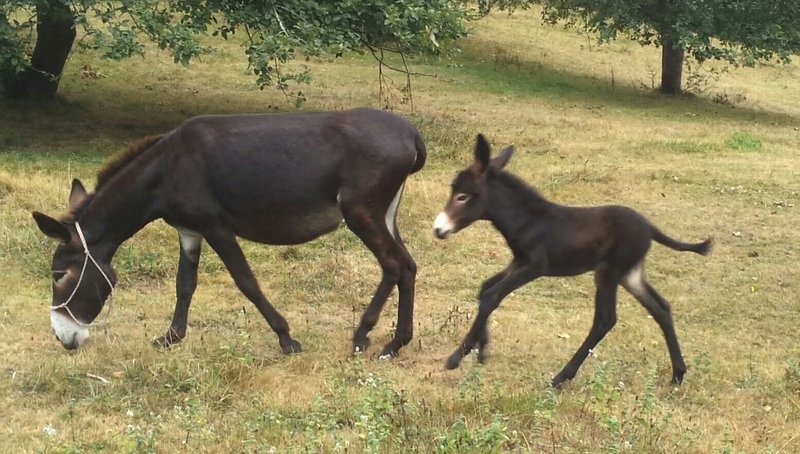 So far, her presence has not disturbed the donkeys of Stable One and Stable Four, who are accustomed to having the main paddock to themselves. In fact, venerable old Alfredo appears to have taken a shine to Bella. Normally, Alfredo skulks around the stables, or restricts himself to the area right in front of the house. 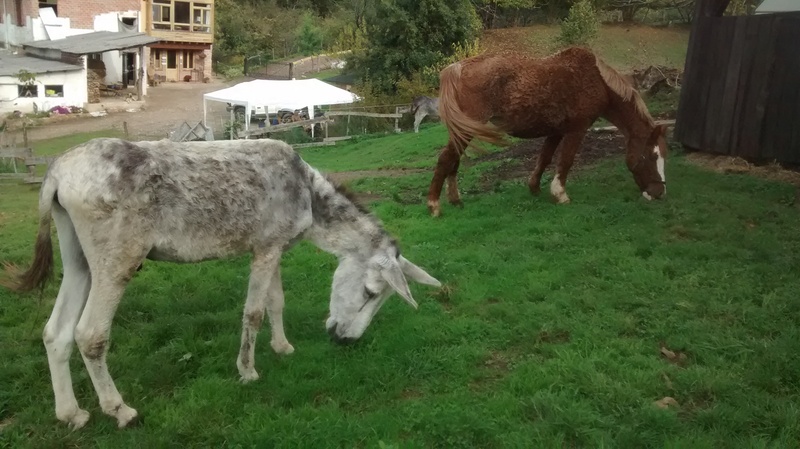 Now, he can often be seen plodding behind Bella and grazing where she grazes, even if it’s out of our sight. 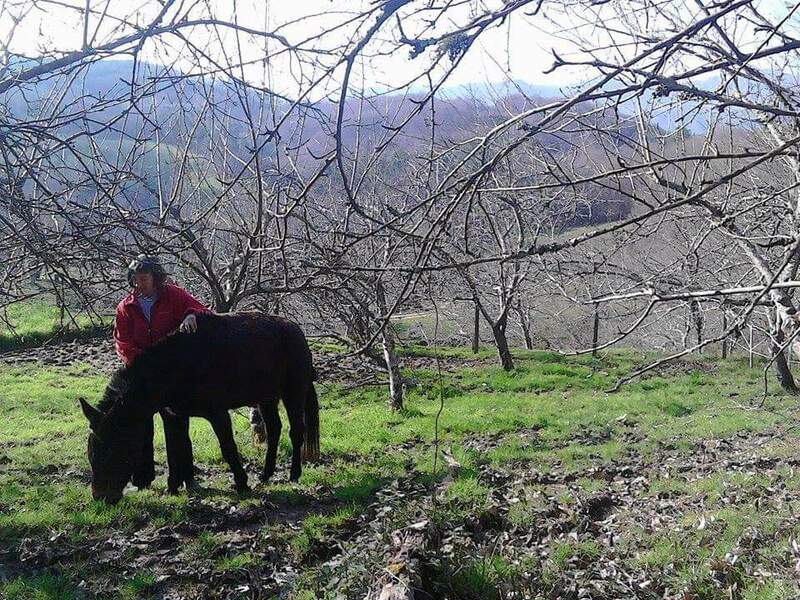 Marleen says that before Alfredo was rescued, he lived in close quarters with a horse. 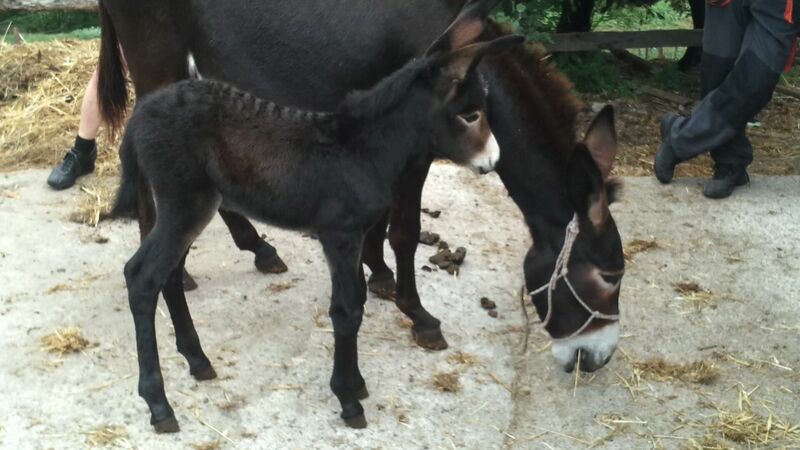 So it might be that Bella has not only gained a new lease of life at Donkey Paradise, but she may also have brought renewed vigour to Alfredo, who can once again have a horse for a friend.